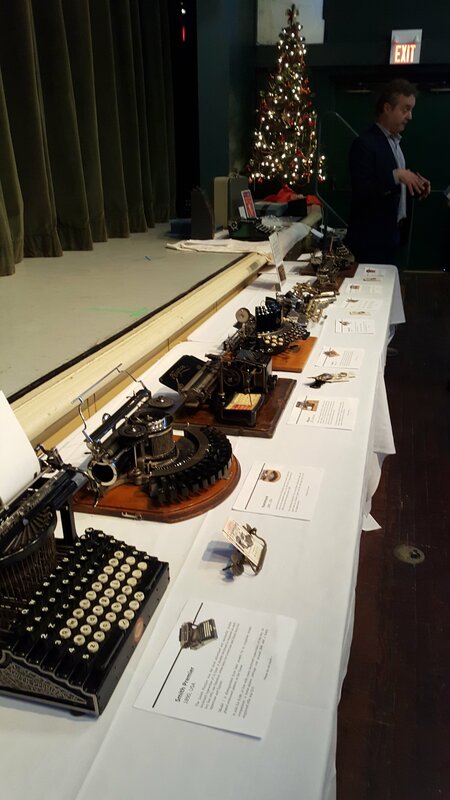 Last Sunday we had a sale table at the 2018 BOUND Book Arts Fair, and in addition to all the vendors there Martin Howard, a collector of antique typewriters, had some of his collection on display. Martin has a web site showing his collection, and he was featured in the recent documentary film California Typewriter. Someone had asked me about casting some number signs so they could put hashtags in their letterpress work. I had mentioned this to another vendor at the fair (I think it was Nick Kennedy from Trip Print Press), and we mused on why this particular letter might have been chosen for its use in social media. It really has no mnemonic value, unlike @ which can be sensibly read as “at” within an e-mail address. I pointed out, essentially, that it was chosen “because it was there” on the computer keyboard, where its presence originates in older machinery like Teletypes and modern (so to speak) typewriters. We were curious about what special characters older typewriters might have had, and conveniently enough, we had a small selection to examine. 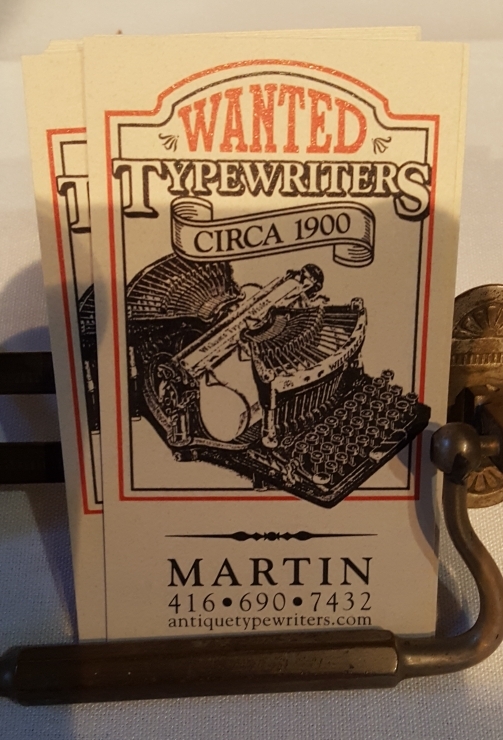 Some of Martin’s typewriters on display had @ and/or # on them, but when we came to look at this typewriter we noticed something interesting that even Martin had not noticed before. 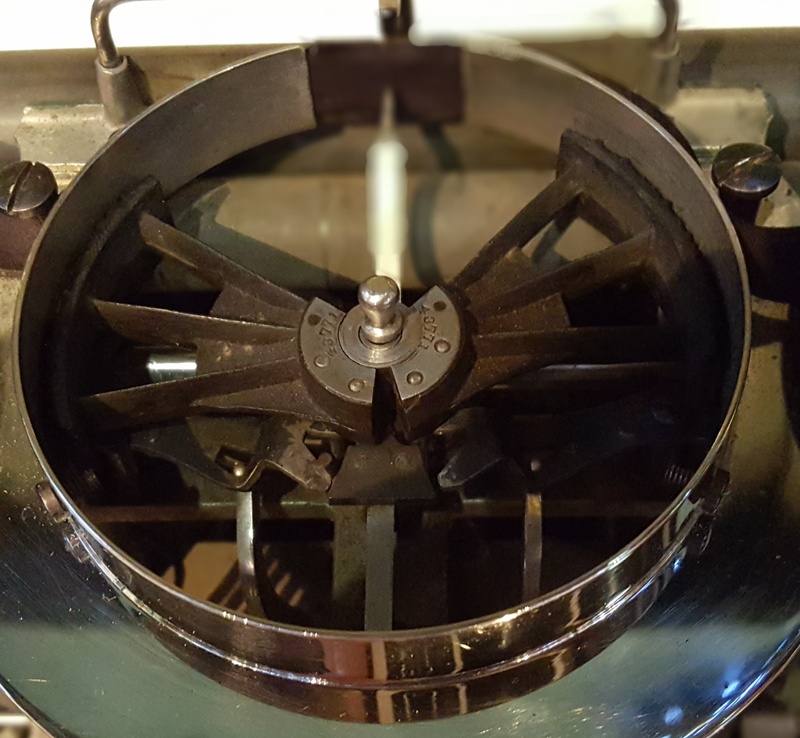 The Hammond 1b typewriter works using two replaceable printing elements, one on either side of a center post. When a key is struck, one of the elements is rotated to place the desired letter at the print position, where it is struck from behind the paper to type the letter. The amount of rotation, and which type element it used, depends on which key is struck. The FIG. (figure) and CAP. (capital) shift keys work by raising the type elements to select one of three rows of letters. Pressing both shift keys together does the same as FIG. alone. The alphabetic keys would normally type a lowercase letter, or if CAP. was pressed, the capital letter, and pressing FIG. would type the alternate symbol which was also marked on the key. Thus the keys would be labelled with a letter and some other symbol, for instance the second key to the right of the space bar is labelled A7, and it types a, A, or 7. Some keys also type a choice of three symbols, and all three appear on the key, for instance between SPACE and A7, there is .-6 which types a period, dash, or 6. But then we noticed the very last keys at either end of the keyboard had four symbols on them! One had ? !¾§, and the other :&⅔Ä. With only a total of three shift states we didn’t see how there could be four symbols, so we asked Martin about this and he hadn’t noticed either. As it turns out, the type elements can be interchanged for ones with other symbol sets, so for instance you could type either the fractions (¾ or ⅔) or special symbols (§ or Ä) depending on the type elements installed. 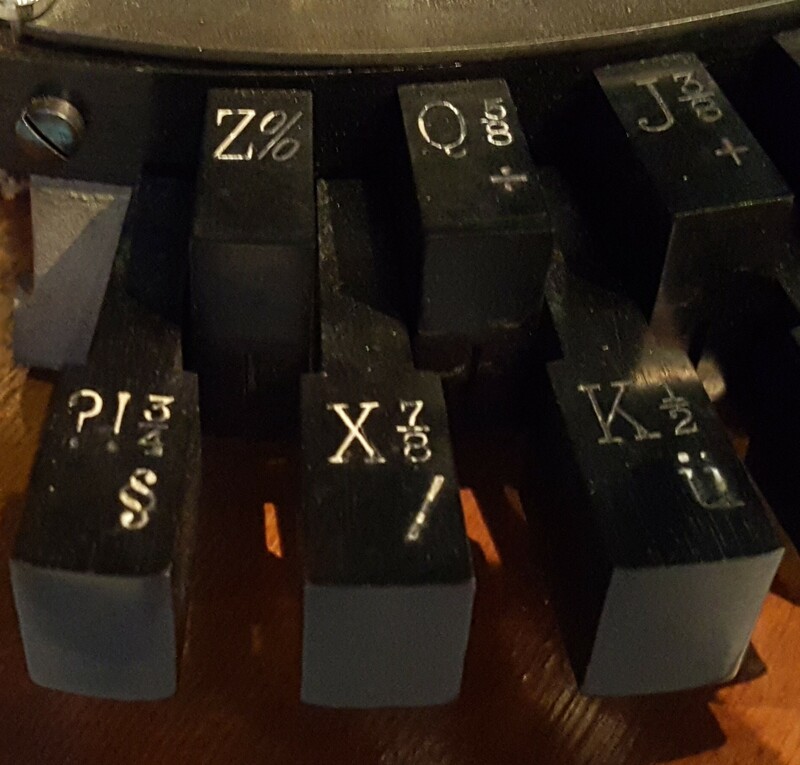 Only as I was writing this post did I realize that the same thing happened for keys that had a letter and two symbols: which of the two symbols was typed depended on the type elements. Examples of these visible in the above keyboard details include X⅞/ and Y⅓Æ, which would type lowercase and capital letters, and one of the symbols shown. Generally, the lower symbols were accented letters, diphthongs, and mathematical symbols, while the upper symbols were fractions, currency symbols, and extra punctuation like square brackets and asymmetric quotation marks. 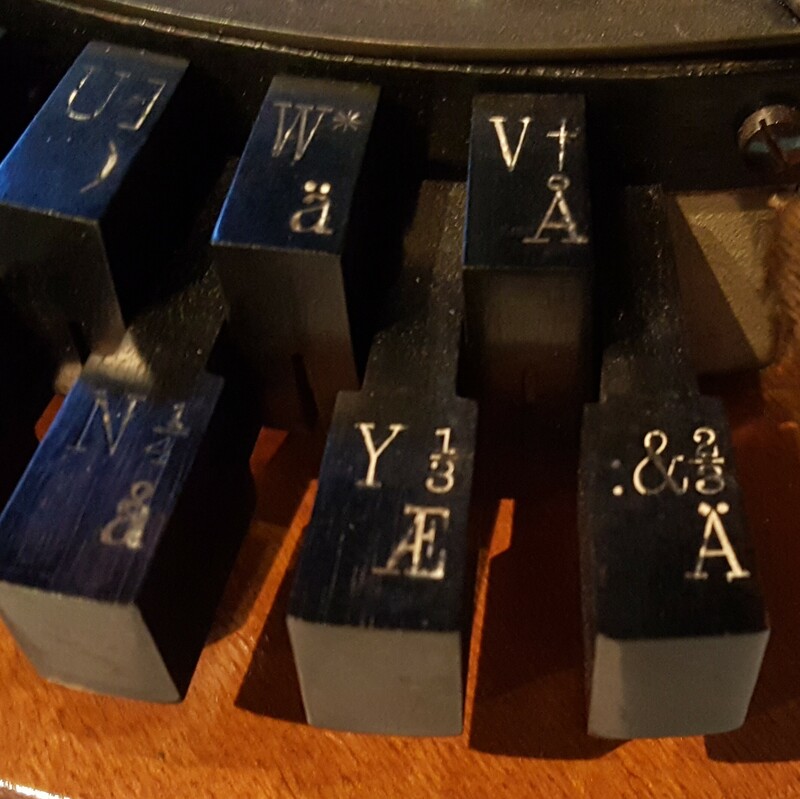 The type elements installed on this particular typewriter would print the lower special characters. I guess this just goes to show where even the most trivial of questions can lead! ‹ BOUND Book Arts Fair next weekend in Toronto! I think the hashtag symbol # was chosen because it was on the *telephone* keypad, not as some random symbol from a typewriter/computer keyboard. Again – a brilliant and fascinating bit of historical information. When I developed the Vietnamese Computerized Typesetting System for the Vietnamese refugees in Southern California, Houston & San Jose, we encountered the same sort of multi-character issues – and had a similar solution. I one of the earliest hardware-controlled systems we made, we installed a toggle switch on the computer to select the standard American character set – complete with all common graphic symbols used in the old DOS machine. Toggle the switch and we read data from the *other* set of EPROMS we had programmed to display the accented vowels plus the multiple combinations of accented *special* vowels that were uniquely Vietnames and not used in other alphabets. Of course, that all became moot when Windows replaced DOS, but “back in the dos days”, ours was the only system that could do this. Ah, that was fun, but to read this history gives it all a different perspective. 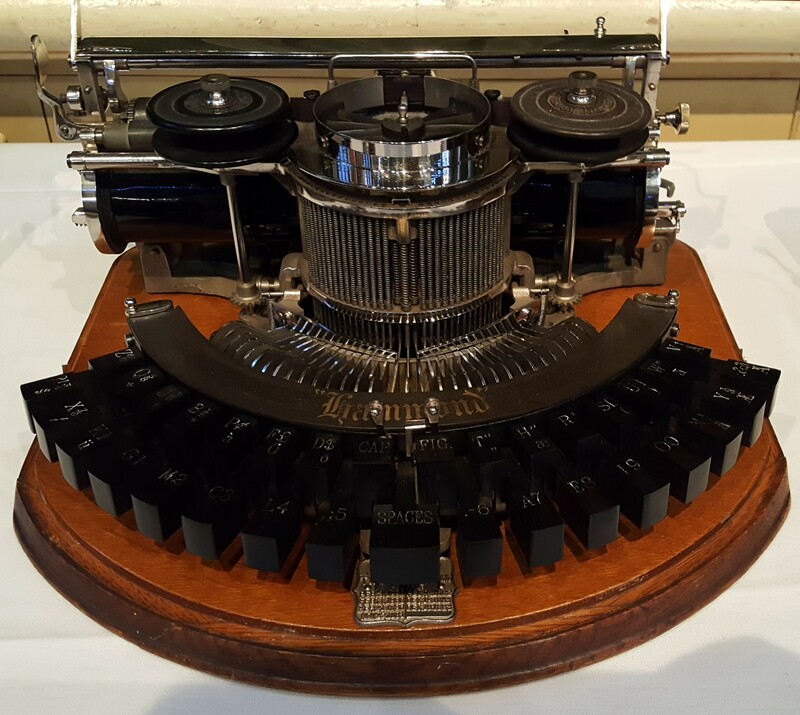 BTW – I saw and old Hammond typewriter at the Edison Museum in East Orange, NJ. He was planning on hooking it up to the telephone lines to transmit text via phone lines – what a novel idea, so many years ago… I wonder if Mr. Martin knows about that one?